A minor update to Aquarium adding a new fish and background, and a fix for a very rare texture loading crash. There hasn't been the demand I originally hoped for with this product, so I'm taking down all the limiters on the free version. The only difference between free and paid now is ads displayed on the title and game setup screens. This version inherits the quicker reloading from Galactic Core and Aquarium. The camera motion has a pref available in the paid version, allowing you to set the speed it transitions at (or off completely, if you prefer). This feature really didn't take too long in and of itself, but for the longest time I couldn't figure out how to find out which home screen the user was on -- then the other day I discovered onOffsetsChanged() staring me in the face, proving once and for all I'm terrible at reading documentation. It's a callback function within Engine that gives you all the data you need. Either way, beyond that there was some general fixing as the scene didn't have things at the proper depth to make parallax make sense, but after a couple hours of adjusting models and scene layout it looks more or less the same, but now provides proper 3D parallax when the camera moves. Huzzah! In testing a user's bug report, I discovered I was reloading textures when I didn't necessarily need to. This is slightly scary but I have it safety checked, and it worked fine through over a hundred portrait/landscape switches on a Motorola Droid -- and it's much, much faster when layout switching. This same change is working its way into my other wallpapers as well. - New Feature: Purple fish! Most of these are pretty self explanatory, I think. The Donation version has an additional pref that lets you turn the bubbler on/off. The number of possible fish has been upped a touch as well, though I reduced the number of possible plants to compensate (Sorry!). In addition, the overhead light was reduced from two passes to one (with the intensity of the texture roughly doubled). This looks pretty much the same (it loses some randomness) but is less expensive to render. I saw a bunch of comments about memory usage in the Silhouette listings, and after spending an afternoon with DDMS was about to call them crazy... then realized that after enough portrait/landscape switching it does indeed revert to the default desktop image. Looking at logCat, this was always accompanied with an "out of memory" message. Weird considering the allocation history didn't show anything unusual or wrong. Well, as it turns out I had a code path that didn't call glDeleteTextures on all my texture IDs, and allocations by OpenGL don't show up as much of anything. I had thought that since the OpenGL context was invalidated when switching portrait/landscape (if you don't reload your textures they're all white) this all got thrown out anyway, but apparently (at least on the Droid) this isn't the case. This is made a bit annoying in that the standard onPause, onDestroy functions don't get handed a GL10 object to work with, so I actually ended up unloading textures in onSurfaceChanged, just before I proceed to precache them again. Slightly weird but it works -- I sat there switching landscape/portrait mode for a half hour and it stayed stable the whole time. I'll have an update for Galactic Core tonight or tomorrow incorporating a few miscellaneous fixes plus better camera zoom in landscape mode and a "very high" spin speed pref. Nothing too earth shaking here, probably the biggest change is acceleration. Basically,when a fish is near its destination, it will slow down and begin turning. When it's done turning, it will accelerate smoothly up to top speed. This removes the slight pop that you could detect when a fish decided to turn around. The memory usage reduction actually stems from reducing the fish texture size. Doing the math on the amount of screen real-estate they use vs the phone's screen resolution, I had the texture higher than it needed to be. In practice this works out, as there's' nothing visibly different so far as I can tell. As a bonus, this reduces load time a touch too. After a couple weeks of progress, Aquarium is now on the android marketplace! Like my other wallpapers, there's both a free and donation version, with the donation version gaining a settings menu. The settings menu in the donation version gives you access to a couple more fish than you see in the free version, and lets you select from four different backgrounds (one of which is a non-busy waterscape, if that's your thing). It also lets you turn on or off the overhead light. Let's actually discuss the settings screen for a bit. Originally I had a grandiose plan to let you hand-place fish and plants as though you were actually assembling a fish tank. This is a cool thing to do, but pretty quickly started making the UI cumbersome (drawer-style menus, drag the fish to where you want it to be, etc). I realize that with most things of this nature, the settings screen is not a common-usage item. In my experience, at least, you'll tend to find a setup you like and stick with it for quite a while. 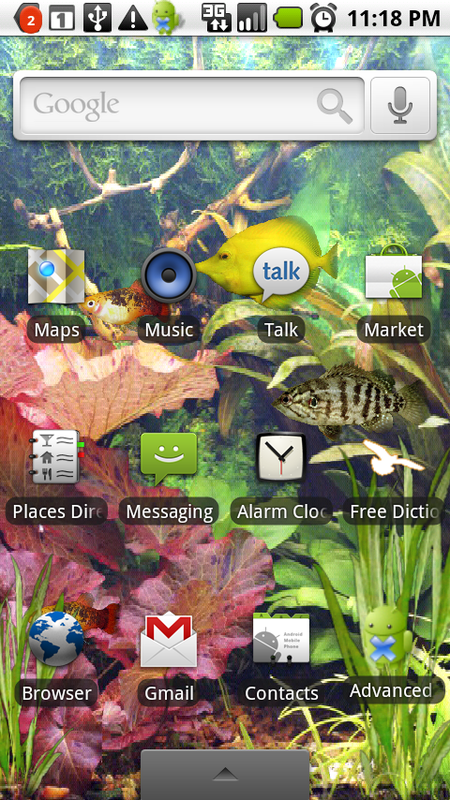 With that in mind, I decided to have the menu randomize the placement of fish and plants. Tap it a few times until you find a mixture you like, then hit back and it'll remember those settings. This kept the interface very simple (and easy to understand, as well) but still gives you the same breadth of options in most regards and doesn't take long to work with. I feel like this was a good compromise between simplicity and the original goal. Been a few days since an update, but I've kept busy. I've got a couple minor bug fixes for Silhouette to test and release, and around the same time will hopefully have my current project ready to go. The next one's an aquarium! This one's been interesting, as I've had to build and animate several fish -- which means a lot more time in Blender than I'd previously had. I'm getting pretty competent at it, I think a new fish is maybe a two hour project now between the texture and the model, assuming I can find good source material. That, in fact, has been the real problem. While it's no big trick to find good photo source (public domain or otherwise royalty-free) for some things, apparently aquarium plants don't fall into that category. The only pictures I ever find are from companies who, well, make and sell aquarium plants -- and I suspect they're not interested in my using their catalog images. This is why there's only a couple of foreground plants in the initial release. I'll add more later if I can find more decent photo source. Currently the background has three wallpapers, three fish, and two foreground plants. I'm intending to add at least another fish or two before release. The settings activity has buttons that will refresh the number of fish/plants and which types -- you can play with them until you find a mixture you like, and it'll keep those settings. You can also switch out the background image and turn on or off the overhead light! There's a couple issues with the Droid that both wallpapers share. 1) A sometimes crash upon hitting the "set as wallpaper" button. The first issue is strange but work-aroundable. Basically, the newly created wallpaper thread gets told to load, then before loading is finished gets told to destroy itself, then after that gets told to render -- not so great when you've just unloaded everything as instructed! I've worked around this by getting an on-demand system in place that can catch a missing-asset exception and do a load if necessary. The second issue is proving the tricky one. As mentioned before both these wallpapers are making use of Robert Green's GLWallpaperService library. This is a really great foundation for OpenGL wallpapers that allows the near-transparent porting of OpenGL code from GLSurfaceView -- something I much appreciate as I'm way better versed in OpenGL than I am in the guts of Android view creation. Unfortunately, sometimes when GLWallpaperService attempts to create a viewport (via eglCreateWindowSurface), the call never returns. What you get instead is an endless string of "waitForCondition(ReallocateCondition) timed out" messages. This is a function that, based on the spec, just shouldn't do this. As you can see by this documentation page, if there's a problem, it should return one of eight possible error codes so that the error can be dealt with (and should never fail to return). The fact that it doesn't return suggests there's a decent chance this is a bug with Motorola's OpenGL drivers, which probably means a glacial fix, necessitating a workaround. I know Mr. Green has been investigating this and with a bit of luck hopefully this can be puzzled out, or possibly someone can explain what's being done wrong on the setup side, though on the surface things all look kosher. Basically, sorry for any folks inconvenienced by this. I'd rather not do an update until the problems can get fixed solidly, so it may be a bit yet.